St Francis was born in Paola, Italy. His devout Catholic parents named him after St Francis of Assisi. He was educated by the Franciscans and, as a student, he was warmly remembered for his, “Sanctity”. At 13 and after completing a one year pilgrimage in a Franciscan Friary, he visited Assisi and various other centres with his parents. On returning home, St Francis chose a life of seclusion, penance and prayer while living in austere conditions including, at one stage, caves near to his family home. At 19, other like-minded people joined him and the origins of a new religious order began. 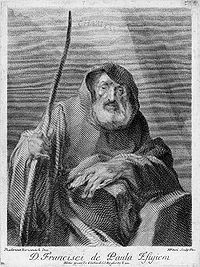 The order was initially called the Hermits of St Francis of Assisi but later renamed the Minim Friars – “The least of all the faithful”. St Francis became renowned for his numerous miracles and gift of prophecy; foretelling various empire conflicts. He remained a layperson throughout his life. His Order continues his ministry today. St Francis’ Feast Day is 2nd April. He is Patron Saint of Calabria, Amato, La Chorrera in Panama, boatmen, mariners and naval officers. Pray for us that we will remain humble and prayerful in all our ways.